If you want to buy a really cool racing game, then you should consider buying Forza Horizon 4. I am going to tell you about the game and why you should buy it. The cost of Forza Horizon 4 is $40.00 for the standard edition; there are other editions but they are more expensive. Microsoft Studios released this game on October 2, and you can play it on Xbox One and Microsoft Windows. But it is not compatible with Playstation. 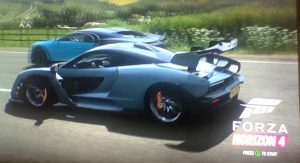 When you start up Forza Horizon 4 you begin with a McLaren Senna. It takes awhile to load up, but while it loads up they have other vehicles on it. The money abbreviation is CR, which is called Credits. Sometimes fast cars are not as expensive as you think, some are like 100,000 CR. You earn money by winning races; the harder the race is, the more money you get. When you get money in the game you can buy cars and upgrade them to where they are much faster. You can upgrade the motor up to the exhaust and you can add turbos and supercharger. When you upgrade it, you can also upgrade the look of the car like the spoiler, hood, grill, then you can add bodykits to make it look even better. Additionally, you can upgrade the drive train to all wheel drive, rear wheel drive, front wheel drive. All wheel drive is better because it makes the acceleration and launch better, so you could win races easier. Aside from earning CR, when you race you go up in levels, and sometimes they give you wheelspins or super wheelspins. Wheelspins give you money or clothes for your character and give you cars. Super Wheelspins spin three slots at a time, so you get more items. Other ways you can get money in Forza Horizon 4 is through chapters, such as: stunt driver chapters and drifting chapters. When you complete a chapter, you go on to the other ones; when you complete all of them, they eventually tell you if there are more chapters to do. I have completed a good bit of them. 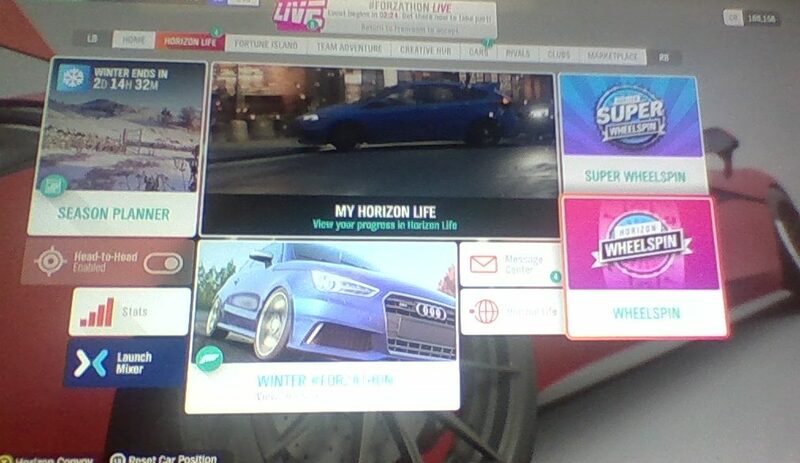 The game also makes use of seasons, so right now it is winter and there is slight snow on the road and a lot of snow on the ground. When it is autumn, there are leaves everywhere and when it rains it is hard to drive because you spin a ton. I highly recommend you buy this game; it’s great to play alone or even more fun to play with your friends.